We’ve all had conversations on Kik or other apps that we wish we could get rid of forever. Maybe we divulged an embarrassing secret or we’re having a sensitive conversation with a work colleague. Either way, if your privacy is important to you, then you should know how to delete Kik conversations permanently. Step 1: Open up Kik app on iPhone. Step 2: Go to the conversation that has the messages that you want to delete. Step 3: Tap and hold the specific message you want to remove until the option to delete it comes up. Just tap “Delete” to get rid of it. Step 1: In the Kik app, find the chat that you want to delete. Step 2: Simply swipe it to the left and tap Delete. Step 3: Tap OK on the “Clear Conversation” confirming window. Step 2: Go to Settings > Chat Settings. Step 3: Tap where it says Clear Chat History. Are Kik Conversations Gone Forever After You Manually Delete Them? The short answer is: No! The long answer is that whenever you delete anything on your iPhone that is stored in your phone’s drive (like your Kik conversations), it doesn’t actually get erased. It’s just removed from your view and marked to be overwritten. Until iOS decides to overwrite the addresses in your database that held the conversations, they will still be recoverable using special software. You don’t even need to be a super hacker or anything to recover the conversations. There is easy to use software out there that will recover data for any determined snoop. So what can you do? Is there anything you can do to protect your privacy and keep someone from knowing what you were up to? Luckily, yes there is. 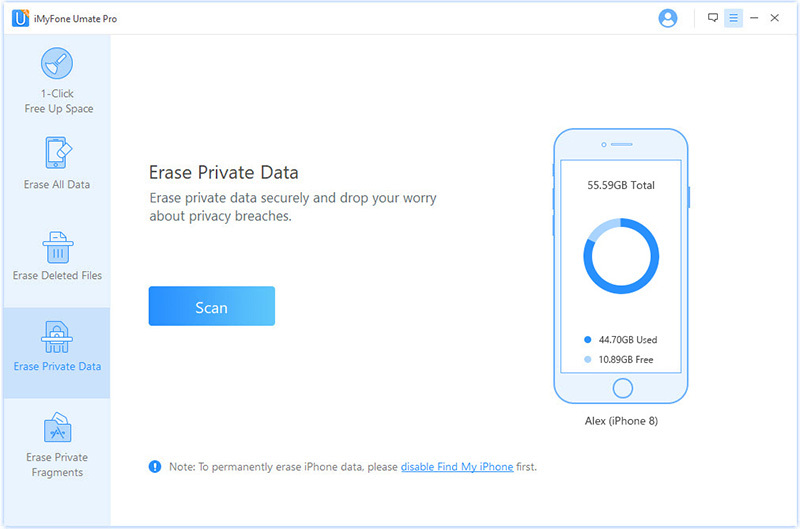 A good application that permanently delete private data from iPhone is iMyFone Umate Pro for Win or for Mac. You can install it on your computer and scan your device for private data, like your Kik conversations, even ones that you thought you had deleted, but that are still lurking in your storage. You can permanently erase private data and make them 100% unrecoverable, like history, messages, chats, cache, notes, contacts, photos, videos, etc. You can preview and erase Kik conversations. You can permanently erase data that you previously manually deleted from Kik. You can clear the Kik cache for free. You can wipe private fragments that are left behind by Kik or other similar apps. Step 1: Download and install Umate Pro on your computer, then plug your iPhone in with your USB cable. Step 2: Open the Umate Pro application. On the left sidebar, click where it says Erase Private Data. Step 3: Click where it says Scan, and the program will begin scanning your iPhone. When it is done, you will see a list of data that you can delete. Select your Kik data from the list and click Erase Now.